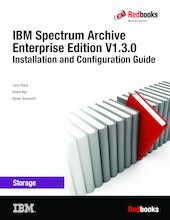 This IBM® Redbooks® publication helps you with the planning, installation, and configuration of the new IBM Spectrum™ Archive Enterprise Edition v1.3.0 for the IBM TS3310, IBM TS3500, IBM TS4300, and IBM TS4500 tape libraries. IBM Spectrum Archive™ EE enables the use of LTFS for the policy management of tape as a storage tier in an IBM Spectrum Scale™ based environment. It helps encourage the use of tape as a critical tier in the storage environment. This is the seventh edition of IBM Spectrum Archive Installation and Configuration Guide. IBM Spectrum Archive EE can run any application that is designed for disk files on a physical tape media. IBM Spectrum Archive EE supports the IBM Linear Tape-Open (LTO) Ultrium 8, 7, 6, and 5 tape drives in IBM TS3310, TS3500, TS4300, and TS4500 tape libraries. In addition, IBM TS1160, TS1155, TS1150, and TS1140 tape drives are supported in TS3500 and TS4500 tape library configurations. IBM Spectrum Archive EE can play a major role in reducing the cost of storage for data that does not need the access performance of primary disk. The use of IBM Spectrum Archive EE to replace disks with physical tape in tier 2 and tier 3 storage can improve data access over other storage solutions because it improves efficiency and streamlines management for files on tape. IBM Spectrum Archive EE simplifies the use of tape by making it transparent to the user and manageable by the administrator under a single infrastructure. This publication is intended for anyone who wants to understand more about IBM Spectrum Archive EE planning and implementation. This book is suitable for IBM clients, IBM Business Partners, IBM specialist sales representatives, and technical specialists.